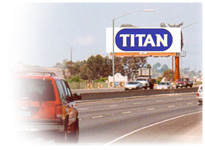 Titan Advertising specializes in high-quality permanent-painted advertising displays. Our billboards are on freeways and major arterial highways in Southern California. Titan has coverage in many highly desirable areas of the Southern California marketplace and we are continually adding exciting new locations. Our dedication to build new signs in upscale communities, near entertainment attractions, and in exclusive coverage areas has put us in a unique position among the independent outdoor advertising companies in California. Small Businesses are the foundation of the American economy. Titan's boutique operation focuses on servicing the small business customer. We are able to provide customized marketing services for small business owners at a reasonable price. We want to help your business succeed. Please contact us at (760) 322-9623.